As a schoolboy I was always fascinated by Martial Arts. Like many others, taking the step to actually start was the most difficult. 39 years ago, at the age of 13, after a Tae Kwon Do demonstration at my school, I commenced what I didn’t realise then, a journey on a lifetime of Martial Arts to come. I am only half way there to date. After achieving 1st Degree Black Belt in Chung Do Kwan Tae Kwon Do under Instruction of Master Chun Suk Suh in 1983, I searched around and trained in some different styles including Ju Jitsu and Karate until in 1984, I was led to try a class in Hapkido. I am grateful to each style I trained as each has their strengths from which I learnt to gather knowledge and experience. Along with a few of my fellow Tae Kwon Do black belts, we tried out some different styles of Martial Arts looking for a challenge. This is how we found Australian Hapkido Association under instruction of Grandmaster Matthew Kim. 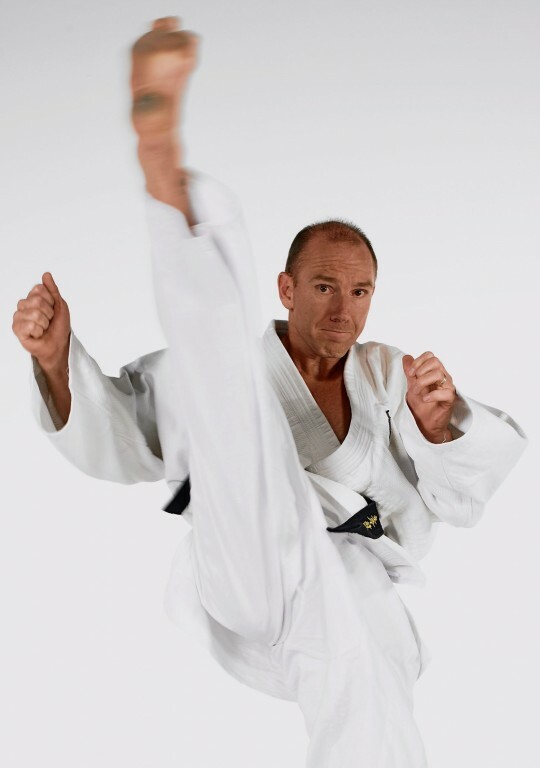 Grandmaster Kim was to become like a 2nd father, with many a lesson learnt in humility, respect, fitness and life skills whilst learning a complex array of Self Defence and Fighting Skills along the way. The first few years we spent up to 5 nights per week training in the City Gym, Oxford Street the Australian Hapkido Association Headquarters. 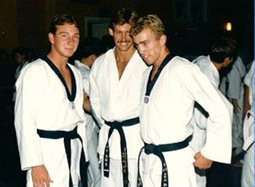 In 1985 Grandmaster Kim brought Hapkido to the Northern Beaches by opening one class in a small hall in North Curl Curl. Master Kevin Brown became an instructor and over time set up classes all along the Beaches. 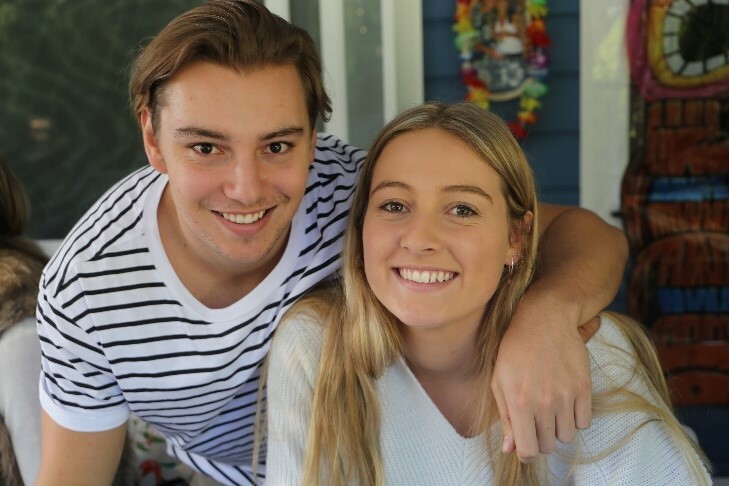 We trained tirelessly out of Halls in Manly, Harbord, Narrabeen, Newport, Chatswood, Terrey Hills. There was a core group of us who trained at least 3-4 times per week. I remember this nugget of a fellow start training with us in the late 1980’s. He was a very talented martial artist and that was the beginning of a long friendship both in and out of Hapkido. Little did I know then that he was to become the formidable Master Steve Tamanini commonly referred to as the “Taminator” by any who have trained in his classes. In 1990 I was living and working in a small town in Tasmania called Scottsdale. There I trained in Bugeido Karate and was graded to 1st Degree under the instruction of Sensei Geoff Reddish. I learnt some good solid sparring techniques, stancework and linear power. Although quite different in some ways to my Hapkido, it helped me realise the importance of variety when it comes to sparring. I learnt never to become complacent doing the same few techniques well, opponents are all different and variety of techniques is the key. I was recently invited back down to Tasmania to attend the 50 Year Anniversary of Bugeido. It was fantastic to catch up with my Old Sensei Reddish and his son Mark who now runs the Tasmanian Bugeido Association. 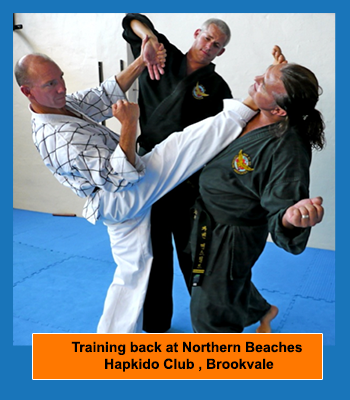 In 1994 Master Brown leased a Full Time Dojang in Brookvale which was to become the home of Northern Beaches Hapkido. 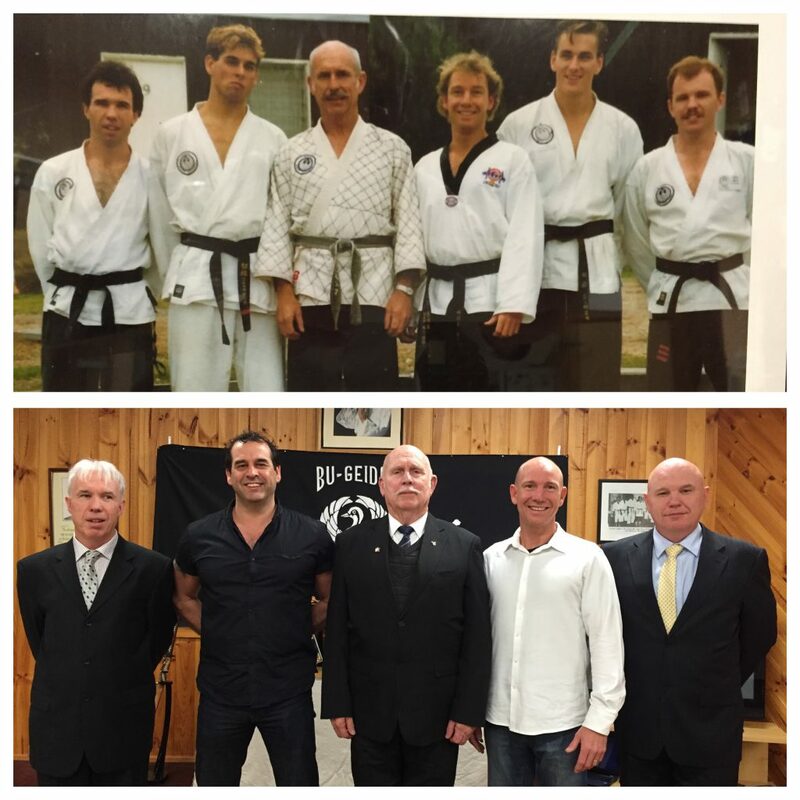 Over time we became the next generation of Hapkido instructors. 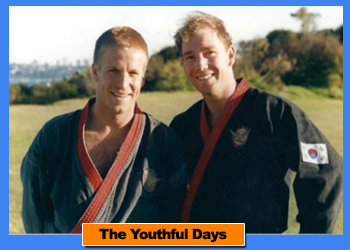 In February 1998, myself , Steve Tamanini and Martin Fox took over the reins of Northern Beaches Hapkido while Master Brown followed his Hapkido national role in leading the Australian Hapkido Association. Master Kevin Brown became the President and Technical Director of the AHA. Every now and then we are fortunate enough to have an occasional guest appearance by Grandmaster Kim who shows that you never lose your spirit and skills. 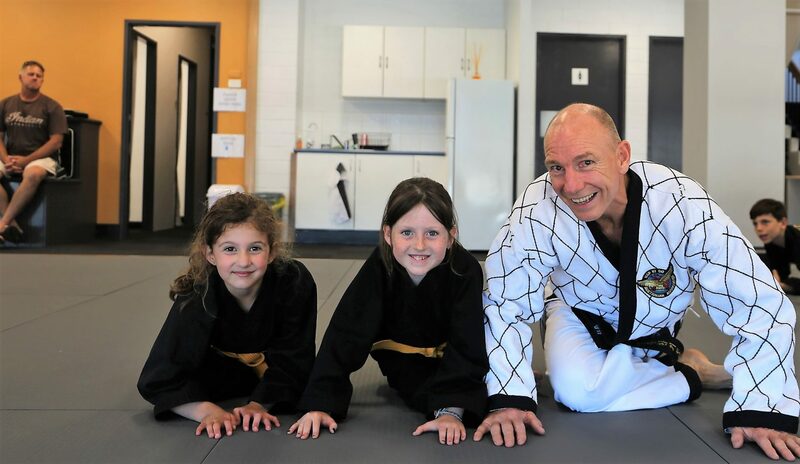 Northern Beaches Hapkido has now been running for 25 years and remains the Sydney based Headquarters of the Australian Hapkido Association, and the central training venue for Sydney based monthly Black Belt training. The bonds formed with each other in Martial Arts Training lay deep and solid. Many of those we started out with are still training today, and those who are not (for one reason or another) still have Hapkido in their blood. On a personal note, I graduated in 1989 in Physiotherapy at Sydney University, working in the field of Sports Physiotherapy and Manipulative Physiotherapy. In 1990 I studied Acupuncture and Chinese Medicine and to this day complement the more Scientific Western Medicine with a combination of very effective and complex Eastern Philosophies and treatments. Currently my Practice MGS Physiotherapy has been running in Manly for 28 years. Hapkido has undoubtedly helped shape my approach to treatment of people’s injuries and pains. It gives me the passion to help others and motivate them to improve their physical and mental well being to enjoy life to the fullest. I have a wonderful, supportive wife Sue and two great children Chad and Rani. It must be frustrating being married to someone who is as passionate and devoted to Hapkido as I am. I am grateful that they have supported me all the way. My work, my training and my family life all relate strongly to each other and form for me a circle. I am proud to say that Chad , now 21 yrs old, has embraced Hapkido as part of his life. Although he has been very active in many school based sports , basketball, soccer, swimming, surfing and music, he really has never stopped Hapkido training since he was 5 years old. He understands there are certain pressures and expectations being the son of an Instructor, and that my aim was for him has always been not to go for his Black Belt until he is really ready both physically and mentally. As a result he continued to train at each belt level for several years with unquestioning patience. In November 2017 he successfully passed a vigorous grading to achieve his 1st Degree Black Belt. 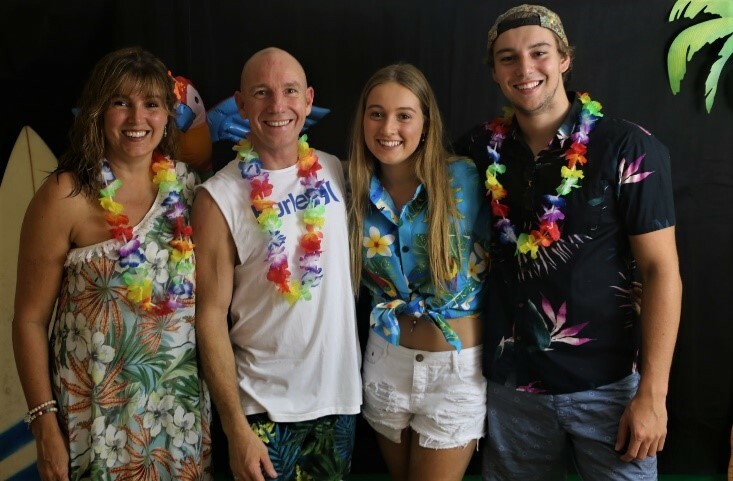 He is successfully developing his skills and confidence by being one of my assistant instructors at our club teaching the Kids and Teenager’s Classes and is proving to be a very popular Mentor for many of our younger (and older) students alike. There have been many training highlights, too many to go into detail. 1995 training in Korea under some inspirational Great Grandmasters. Pung Ryu Do (the Korean form of Tai Chi) with Professor Huh, Grandmaster Byung Chun Kim, Master Woo. Over the ensuing years visits and training with Grandmaster Ji Han Jae, Master Lee Jeong Seo, Lee Jae Bum, Professor Don Jacobs. 2006 I was in Korea to help celebrate the 20th Anniversary commemorating the death of the founder of Korean Hapkido, Dok Am Choi Yung Sul Dojunim. It was a very physical and spiritual few weeks training under the Instruction of Dojunim Kim Yun Sang. He was one of Choi’s original students and on Choi’s death bed promised him that he would continue to train daily and teach Hapkido exactly as he was taught. It was a fantastic preparation for my 5th Degree grading the following year. Since then I have been fortunate enough to have two more trips to Korea, and every time have come back with a wealth of knowledge and more importantly understanding of our Art, it’s history and it’s complex principles. Each Master I trained with has their own special approaches, techniques and philosophies, yet we are all striving for the same goal, to master Hapkido. Along with my own Grandmaster and Master, I have a great deal of respect and gratitude for Grandmaster Byung Chun Kim, Professor Huh, Master Woo, Master Lee Jeong Seo, Master Lee Jae Bum, Dojunim Kim Yun Sang, Master Kang, Master Kim, Master Choi, Master Jang and thank them for their dedication and for sharing their knowledge. 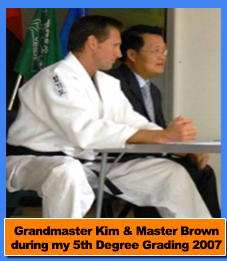 2007 – I was graded to 5th Degree on 1st of April by Grandmaster Matthew Sung Su Kim and Master Kevin Brown. I was fortunate to grade beside Master Daniel Marie, my fellow 5th Degree, who is a never ending wealth of information of technical brilliance in all facets of Hapkido. I credit Daniel with teaching me how to constantly re-evaluate my techniques and be more analytical, something which has never been my strong point. Daniel and I spent the final year preparing for our 5th Degree grading and had some secret bush training sessions which will stay in my memories forever. 2010– I was nominated onto the Committee of the Australian Hapkido Association. It is a way that I can give back to the Martial Art which has given me so much. The committee is made up of eight likeminded and very dedicated Hapkido black belts. Our role is to help and support Hapkido clubs around the country, keep a strong structural base for membership and allocation of funding , and work hard to maintain the highest quality of instruction and training standards around the country. My role within the AHA has given me the opportunity to travel around the country meeting many of our dedicated Club Instructors from all walks of life, from big cities to small country towns. Many lifelong friendships have been formed for me and never have I returned from a trip not having learned or experienced something new that will continue to shape my life. 2017 – I was fortunate enough to be invited to Germany by Master Volker Goessling, the President of the German Hapkido Federation. 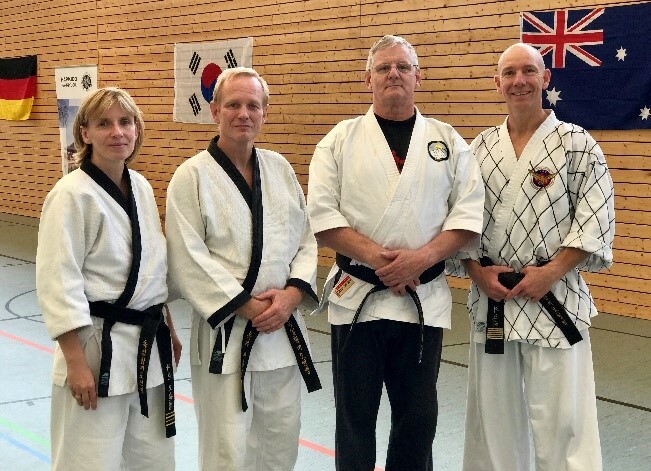 Master Volker, his wife Master Nadine and their lovely family were amazing hosts, and arranged 2 weeks of Hapkido Seminars for me to share our AHA skills and philosophies with fellow German Hapkidoists. 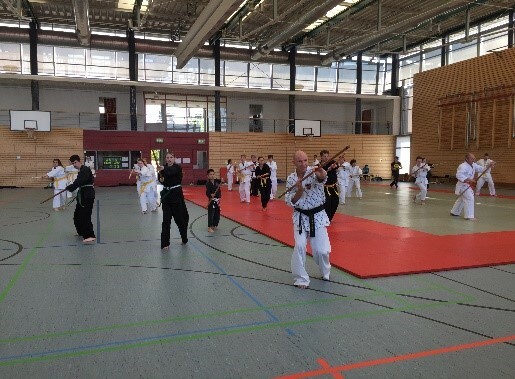 It was so refreshing to find such similarities and high quality Hapkido over the other side of the world, even though my German speaking skills were stretched to their limits teaching in German. We have forged some fantastic friendships, and opened a reciprocal training and social relationship for all of our members to benefit from. Hapkido is a complex Martial Art with many facets to learn. I have made many close friendships with those I have trained with, some are still training others not, but we still remain like family. We have an outstanding bunch of Hapkidoists training at our club in Brookvale, it is easy to take for granted the high levels of experience amongst our senior ranks with the likes of Simon Callaghan (4th Degree), Andrew Dunn (3rd Degree), Michael Sladden (3rd Degree), Justine Lobb (2nd Degree), Mel Thomas (1st Degree), Chad Geister (1st Degree), Will Hurst (1st Degree). Not to mention our up and coming Black Belts coming through to become our next generation of senior instructors.